This 2.5 acre lake has 20 comfortable swims, 3 islands and depths of 5 to 6 foot mainly. 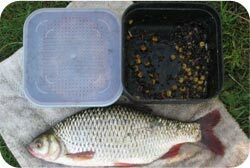 It is heavily stocked with Carp, Crucian Carp, Bream, Tench, Roach and Rudd. The lake is available for single day tickets and group bookings. Home matches are held on the 2nd and 4th Sundays in the months of March through to October. There is a weekly golden peg and a decent prize fund with a trophy for the season's overall winner. Everyone is welcome to attend these home matches.